If you've been following the development of EVE Online lately, chances are you've heard of Andie 'CCP Seagull' Nordgren and her mission to make deep space colonisation and player-built stargates a reality. 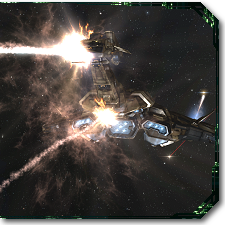 Andie has spearheaded the direction of EVE's development over the past few expansions and has gathered a considerable following in the EVE community. At EVE Fanfest 2014, we heard her plans to overhaul EVE's outdated sovereignty and corporation management systems, and to eventually introduce new deep space colonisation gameplay. Today CCP announced that Andie Nordgren has been promoted to the position of Executive Producer on EVE Online. I caught up with her for a chat about development on EVE and to find out what this promotion means for the future the game. I've pulled together the important details from the interview in this article, and if you still have burning questions for Andie Nordgren, she's doing an AMA thread on Reddit right now! In her old Senior Producer position, Andie was responsible for the overall development direction of EVE Online. As the Executive Producer, she'll now also be broadly responsible for the business side of EVE too, including marketing, sales, customer support, and operations. I was told that the plan for EVE is the exact same as before, except that Andie doesn't have to convince anyone of strategic decisions any more -- Now she's the one making them. What does that mean for EVE? It's good news then for EVE Online players, as features like the corporation and sovereignty overhauls promised at Fanfest 2014 are still firmly on the table. With EVE having recently moved from two expansions per year to ten smaller releases, there are now opportunities to take on huge features that would take more than one expansion cycle to fully deliver. The nullsec sovereignty and corporation management systems are two colossal areas that have been neglected over the years, and both will be overhauled in small steps that make sense to release on their own. "We'll see more buildup of large features over multiple releases," Andie explained, confirming that developers will now be able to add new features when iterating on a game system rather than just bug-fixing and balancing. She also confirmed that the recent Crius industry patch was the last release to contain gameplay originally planned as part of an expansion. We can expect further releases to be smaller in terms of individual scope, but large features will still be tackled in stages. With some of EVE's most visible developers (such as CCP Soundwave, CCP Navigator and CCP Zulu) having left CCP over the past year, I asked whether we can expect more interaction between other developers and the community in the future. "Developers can talk much earlier about features they're working on" due to the new release schedule, Andie explained, adding that the new schedule is "empowering the teams and developers more to drive more features, and giving teams more power and independence." As players, we can look forward to regular livestream events to show off the work done on each release, more videos of ongoing development, and longer forum communication with the community. New content will also be introduced in a lore-friendly manner just as with with the introduction of Ghost Sites and the new Guristas research sites, and we can even expect more live events and chronicles to be released around major updates. "The game is a stage for players, and a backdrop to the big changes," Andie told me. "The integrity of the world is important." While Andie wasn't able to answer my request for more details on exactly what's coming in the upcoming releases, she did confirm that more gameplay will try to incorporate small groups and individual players. Rather than developing features explicitly for solo players or small groups, however, CCP aims to have smaller events happening across the universe that ultimately tie into the grand scales of events like alliance wars. "EVE is like a large asynchronous distributed board game that you're playing with other people," Andie told me. "This doesn't necessarily mean that you're playing with them all the time in real time, but you can move your piece and the next day someone could come across your piece you moved. For me, EVE Online is the world's largest living work of science fiction, and a challenging game where player actions and initiatives really rule." When readers want the scoop on a launch or a patch (or even a brewing fiasco), Massively goes right to the source to interview the developers themselves. Be they John Smedley or Chris Roberts or anyone in between, we ask the devs the hard questions. Of course, whether they tell us the truth or not is up to them!